We have a Dog Life Chose Me and Foodie Files crossover event! 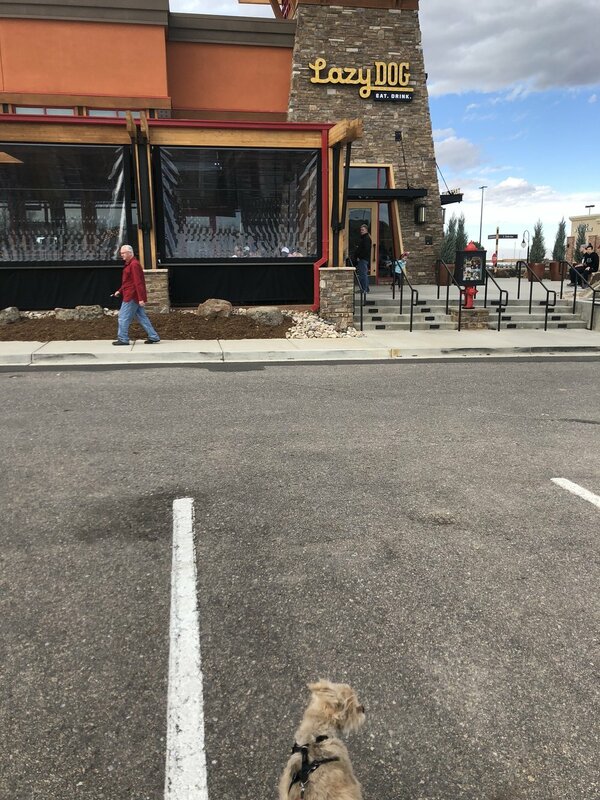 When the Westminster Lazy Dog Restaurant and Bar opened, I was really excited to be able to take Jax. Then they announced an Aurora location would be opening soon, which would save us a hike. With locations in California, Nevada, and Texas, it's great to see Colorado grab two restaurants in the last few months. Jax took me to Lazy Dog on a warm, sunny Saturday evening for dinner. 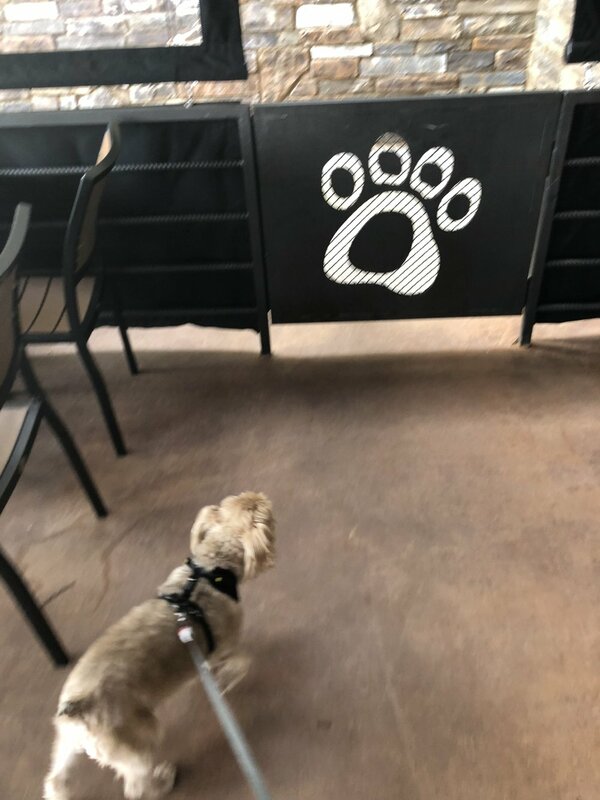 Pups and dogs are allowed at the restaurant, but only on the patio, which was mostly screened in when we visited. There's plenty of room and seating on the patio, including a few fire pits to socialize or watch television. We were quickly seated upon arrival and Jax (and I) received his menu. The dog menu includes some basic patio rules. For instance, for hygienic reasons, the waitstaff cannot pet your dogs; although they really wanted to pet Jax! Jax was slightly offended at first, but understood the policy. After we both received our waters, Jax decided on the burger with rice and veggies (peas and carrots). They asked which temperature he would like his burger (medium) and type of rice (brown vs. white). Fancy! Moments later, his entree came. What a healthy portion! 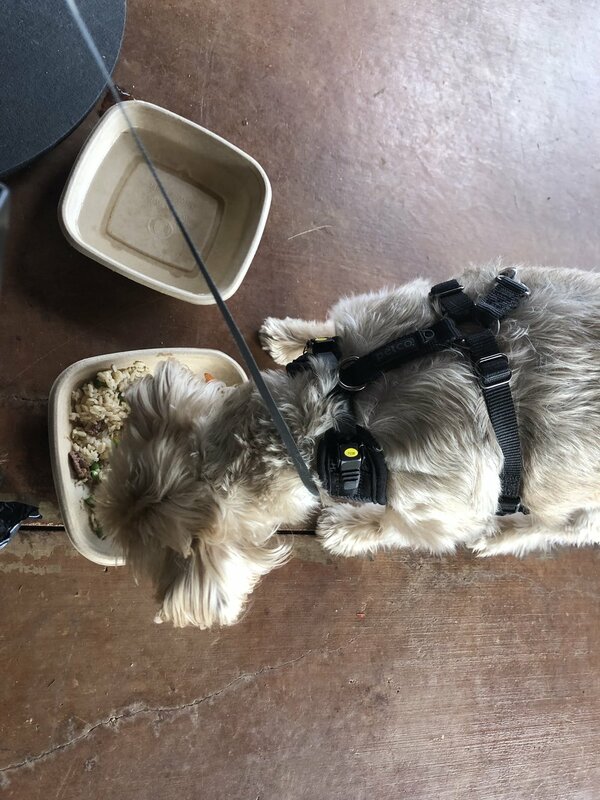 Jax enjoyed his dish and it appeared prepared to his liking. For those who care about the human menu, it was quite extensive with a ton of appetizers, small plates, sandwiches, and burgers. Their drink menu was also pretty hefty and I ordered a pomegranate sangria. For dinner, I ordered two small plates--The buffalo chicken lollipops with slaw and the mac and cheese, which was loaded with bacon and hatch chilies. Both were delicious and very filling. The buffalo chicken could have used a bit more spice; especially for those who like spicy wings. We had a great time at Lazy Dog! Again, the human menu was quite extensive and eclectic, so I look forward to trying more the dishes and burgers later. Jax would also like to try their chicken, so we will likely be back later in the spring/summer! Does your dog enjoy fine dining? Have you been to Lazy Dog? Chicken or a burger for your pup? Leave your feedback in the comments below!